The Bimini Baths have been gone for more than 60 years, but I grew up hearing family stories about how amazing they were. 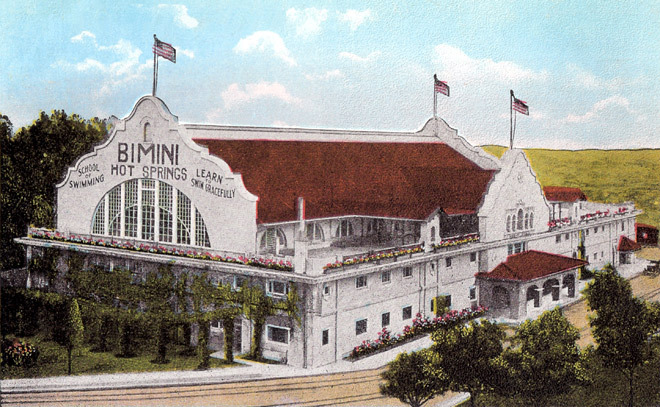 This mission-style swimming pavilion was replaced with a dreary cinder block church and parking lot, but according to this clip the artesian springs remain near Vermont and Beverly. I love that puppeteer Bob Baker and former L.A. Conservancy staffer Connie Humberger are among the interviews. They’re good friends and bright shining windows into old L.A. that I treasure. If I can’t see it with my own eyes, at least I can see it through theirs.